Is this good enough in the face of the 27-inch competition? 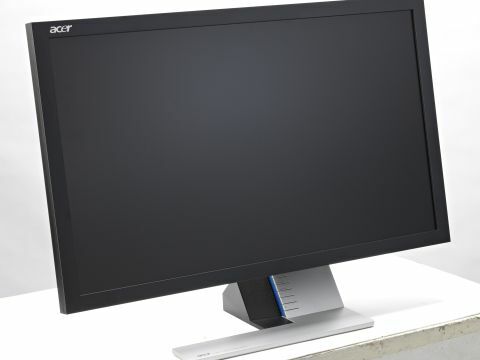 Acer's new 27-incher looks good on your desk. But it's pricey for a TN panel with humdrum image quality. At nearly £400, the new 27-inch Acer S273HL looks rather lonely. It's much more expensive than budget-oriented 27-inch monitors such as Iiyama's E2710HDS. And yet it's significantly cheaper than Dell's high-end U2711 uber panel. That wouldn't necessarily be a problem if it weren't for the fact that most of the Acer S273HL's specifications place it firmly in the budget camp. Yes, it's powered by an LED backlight. But it also makes do with the standard 1,920 x 1,080 pixel grid. That resolution works well enough on screens up to 24 inches, but the pixels become pretty plump extended over 27 inches. What's more, the S273HL has a TN LCD panel like the cheaper Iiyama monitor, rather than the superior IPS technology found in the Dell. What, then, can possibly justify the premium pricing? Acer has certainly put extra effort into the design and presentation of the S273HL. But unless it has achieved something special in terms of image quality, it's going to be a tough sell.